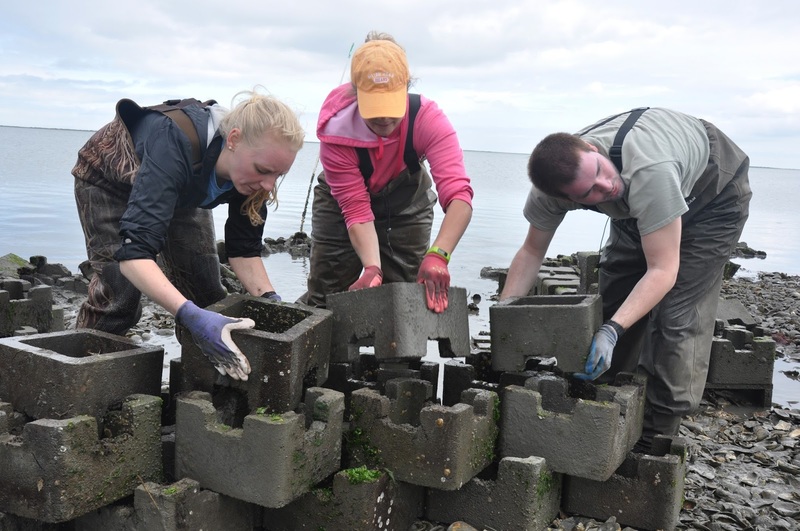 On September 5 and September 20 of 2017, the VLM sent 8 staff from 3 departments, as part of a collaborative effort between the Nature Conservancy and University of Virginia, to help transport and construct functional oyster habitats out of concrete “castles” that are also designed to keep up with sea level rise. 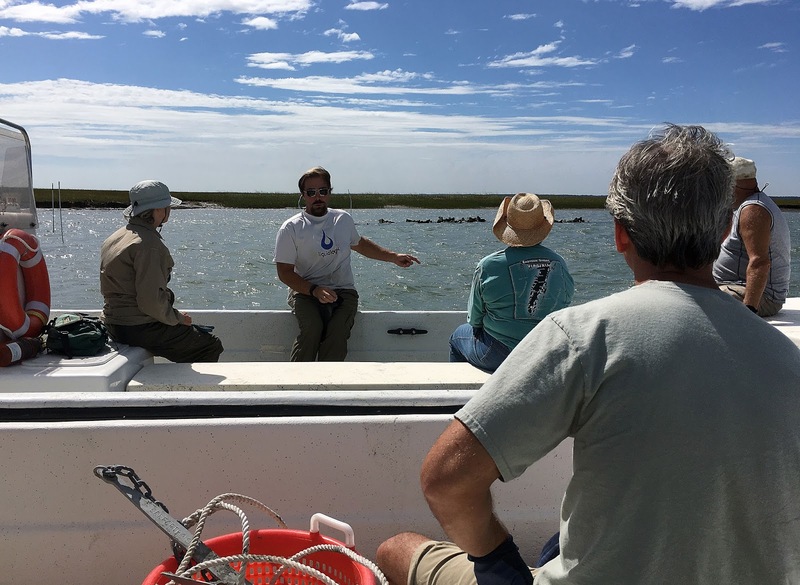 This is the third year and fifth round that the VLM provided staff to construct these reefs at multiple sites along the Eastern Shore of Virginia. 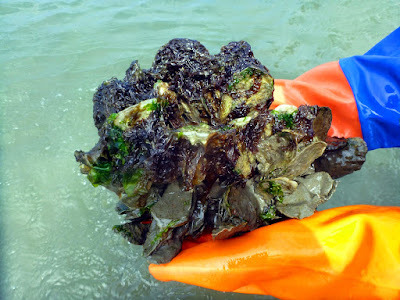 We have helped build new habitats off of Chincoteague, Oyster, and most recently Nassawadox. Getting instructions and some history behind oyster reef construction from Bo Lusk of the Nature Conservancy. The VLM has contributed 66 man hours so far this year (with one round to go) to the effort, and has contributed nearly 250 hours over three years. 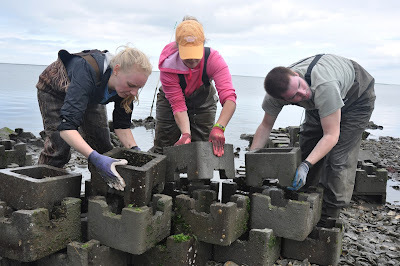 In a typical day, we help construct at least one complete reef that spans 80 feet long and comprised of over 500 thirty pound blocks – that’s over 15,000 pounds of concrete moved and assembled into useful oyster habitats in one day! These reefs are constructed of tiered concrete blocks that are designed to be stacked and interlocked vertically into a pyramid-like structure. Different locations have different castle arrangements, depending on the tides. Above are the desired arrangements for Chincoteague, VA. These are the desired arrangements for Oyster, VA. 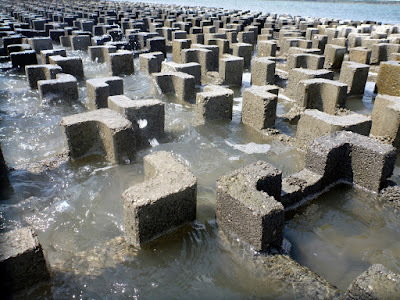 When these stacked blocks are oriented in a staggered horizontal line, they create a three dimensional reef that acts as a breakwater to diffuse wave energy, trap sediment also allows plenty of hard surface for oyster spat to settle on preventing their possible burial. The University of Virginia is experimenting with different configurations to assess which height, length, orientation, and style of reef most effectively reduces wave action as well as supplying much needed habitat for oysters. 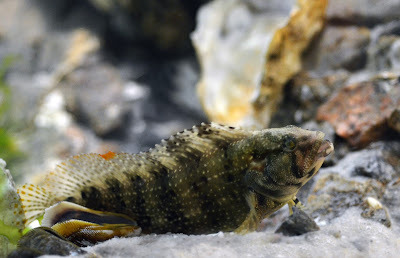 Many different fishes and invertebrates live among oyster reefs, such as this striped blenny. Though the work is physical – and you will get wet and dirty – you can contribute as much as you are able while making a tangible contribution to our environment. It is very gratifying to see a completed structure assembled on what was once just a bare mud flat that will become home to not only a future oyster reef but countless crabs, shrimp and fishes.